The following categories describe different ways that we use and disclose your health information without your authorization. For each category we explain and may give an example. Not every use or disclosure in a category will be listed. However, all of the ways we are permitted to use and disclose information will fall within these categories. We use and disclose health information about you for treatment, payment, and other services. We may use or disclose your health information to a doctor, nurse, hygienist, technician, receptionist or other healthcare provider who has provided treatment to you, is providing treatment, or we reasonably believe will provide treatment to you. A letter or report will usually be sent to your general dentist, along with other doctors who are related to your care. We may need to talk to another provider who may need to provide care when one of our doctors is away. We may talk with a family member who may assist you with care outside of the office. We may use and disclose your health information to obtain payment for services we provide to you. We may send your health information to an insurance company or other third party. We may tell an insurance company or third party about care you could receive, or are receiving, in order to determine your coverage or obtain prior approval. In order to run our practice in a way that ensures that our patients receive quality care, we may use and disclose your health information in connection with our healthcare operations. Healthcare operations include quality assessment and improvement activities, reviewing the competence or qualifications of healthcare professionals, evaluating practitioner and provider performance, conducting training programs, accreditation, certification, licensing or credentialing activities. We may include health information in medical reports, and use and disclose health information to contact you by mail, phone, email, sms, or other medium, to remind you of an upcoming visit. We may use and disclose information to leave a voice mail or other message at a phone number you have provided, or to someone who answers a telephone at a number you provided, to provide health information that, in our judgment, needs to be communicated to you. We may use and disclose medical information to tell you about or recommend possible treatment options or alternatives or health-related benefits of services that may be of interest to you. We may use health-related information to review our treatment and services and to evaluate the performance of our staff and doctors in caring for you. We may disclose health information to doctors, resident doctors and students for peer review and learning purposes. We are required by Michigan law to obtain your written consent prior to making certain disclosures of your protected health information (PHI). We may use or disclose your health information when we are required to do so by federal, state, or local law. For example, we are required to report suspected child or elder abuse, sexually transmitted diseases, etc. We may release health information if asked to do so by a law enforcement official. We may disclose your health information to a health oversight agency for activities authorized by law. These oversight activities may include audits, investigations, inspections, and licensure. These activities are necessary for the government and other agencies to monitor the health care system, benefit programs, and compliance with civil rights laws. We may disclose your health information as authorized by and to the extent necessary to comply with workers’ compensation laws or laws relating to similar programs. We may disclose your health information to appropriate authorities if we reasonably believe that you are a possible victim of abuse, neglect, domestic violence or the possible victim of other crimes. We may disclose your health information to the extent necessary to avert a serious threat to your health or safety or the health or safety of others. We may release health information about you to a friend, a family member or other relative, or any person who is authorized by a parent or guardian to bring a minor patient to our office for care. We may also give information to someone who helps pay for your care. We may use or disclose your health information to provide you with appointment and pre-medication reminders (such as voicemail messages, postcards, e-mail, sms, or letters). We may use and disclose your health information to provide appointment reminders by telephone or electronic medium. If you do not wish for us to contact you about treatment alternatives, health-related benefits or appointment reminders, you must notify in writing the person listed on the last page of this notice at each appointment, and state which of those activities you wish to be excluded from. If you provide us authorization to use or disclose your health information, you may revoke that authorization, in writing, at any time. If you revoke your authorization, we will no longer use or disclose health information about you for the reasons covered by your written authorization. You understand that we are unable to rake back any disclosures we have already made under the authorization, and that we are required to retain our records of the care that we provide to you. You have the right to look at or get copies of your health information, with limited exceptions. You may request that we provide copies in a format other than photocopies. We will use the format you request unless we cannot practicably do so. You must make a request in writing to obtain access to your health information. You may obtain a form to request access by using the contact information listed at the end of this Notice. We will charge you a reasonable cost-based fee for expenses such as copies, materials, mailing, supplies, and staff time. You may also request access by sending us a letter to the address at the end of this Notice. If you request an alternative format, we will charge a cost-based fee for providing your health information in that format. If you prefer, we will prepare a summary or an explanation of your health information for a fee. Contact us using the information listed at the end of this Notice for a full explanation of our fee structure. You have the right to request that we place additional restrictions on our use or disclosure of your health information. We are not required to agree to these additional restrictions, but if we do, we will do our best to abide by our agreement (except in an emergency). To request restrictions, you must make your request at each appointment, in writing, to the Privacy Officer named at the bottom of this form. In your request you must tell us 1) what information you want to limit; 2) whether you want to limit our use, disclosure, or both; 3) to whom you want the limits to apply. Typically we communicate with you regarding your health care either by the phone numbers you provide, through email, or through mail at your home address. You have the right to request that we communicate with you about your health information by alternative means or to alternative locations. You must make your request in writing, at each appointment, and deliver this request to the office’s Privacy Officer. Your request must specify the alternative means or location. If your requested type of communication increases our costs, there may be a charge to you, which we will do our best to inform you of in advance. You have the right to request that we amend your health or billing information, as long as that information is kept by our office. Your request must be in writing, delivered to the Privacy Officer at the address listed at the bottom of this form, and it must explain why the information should be amended. We may deny your request under certain circumstances, including but not limited to: if the information was not created by our office, if the person who created the information is no longer available to make an amendment, is not part of the health information kept by our office, is not part of the information which you would be permitted to inspect and copy, or if the information is accurate and/or complete in our judgment. If you do not want our office to release to your health insurance carriers information regarding your services here or other health information, you should inform our staff. In that case, you will need to pay the charges for your services here yourself, prior to the time that services are provided. If you receive this Notice on our website or by electronic mail (e-mail) now or in the future, you are entitled to receive this Notice in written form. To obtain a paper copy of this notice, the Privacy Officer listed at the bottom of this form. 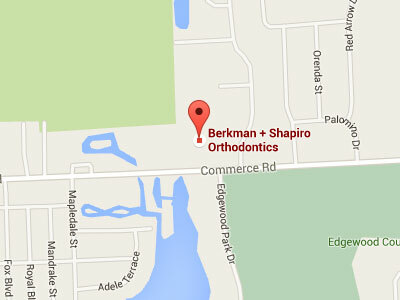 This notice describes the practices of Berkman + Shapiro Orthodontics, PC and those of all officers, employees, staff, or other Covered Entity personnel. These may include all laboratories we utilize for testing of our patients. We reserve the right to change this Notice. We reserve the right to make the revised Notice effective for health information we already have about you as well as any information we receive in the future. We will post a copy of the current notice in the waiting room. If you are concerned that we may have violated your privacy rights, or you disagree with a decision we made about access to your health information or in response to a request you made to amend or restrict the use or disclosure of your health information or to have us communicate with you by alternative means or at alternative locations, you may submit a written complaint to us using the contact information listed at the end of this Notice, and/or the U.S. Department of Health and Human Services. We will provide you with the address to file your complaint with the U.S. Department of Health and Human Services upon request.